Saw palmetto is now the second highest-selling herbal supplement in the U.S. Find out more about its history and medicinal uses. Revered as food and herbal medicine for thousands of years, saw palmetto was first used by Native Americans, long before the arrival of Europeans, to treat a wide variety of illnesses. Due to its acrid, bitter taste, it took a while for saw palmetto to become a popular medicine among the first English settlers; however, this aesthetically unappealing and distasteful herb is highly valued nowadays, and its benefits for prostate health have been corroborated by many scientific studies. Reducing enlarged prostates. With its anti-inflammatory properties, one of saw palmetto's main medicinal values is its ability to reduce enlarged prostates. Hormone Regulation. Saw palmetto is believed to be a highly effective anti-androgen as it may play a role in regulating levels of testosterone. Treating hair loss. In traditional medicine, saw palmetto was used to treat hair loss in men. Treating urinary tract infections. Studies have shown that saw palmetto is an effective treatment for urinary tract infections, especially for men. Relieving benign prostatic hyperplasia (BPH). Research shows that taking saw palmetto in the months leading up to prostate surgery may help with recovery. Saw palmetto may also help treat enlarged prostates. Regulating urinary functions. Research suggest that saw palmetto may increase bladder's capacity to hold urine, which would reduce frequent urination. The main constituents in saw palmetto are phytosterols and fatty acids. These are found in the berry of the saw palmetto tree and are responsible for its purported health properties. 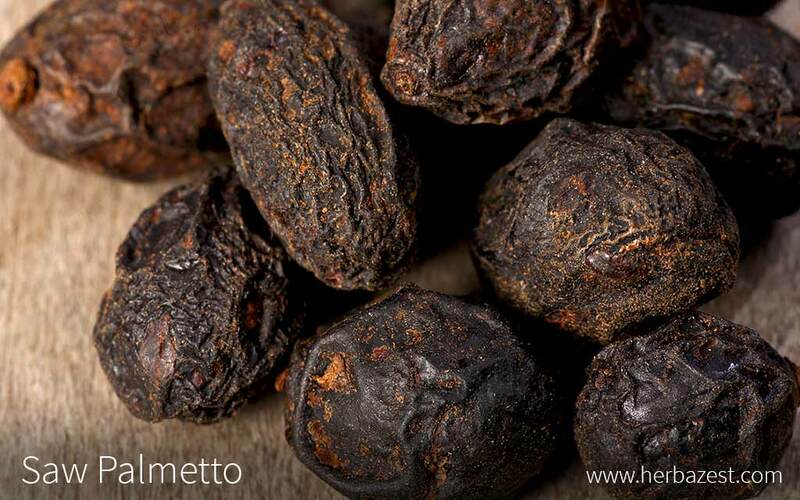 Saw palmetto is primarily used in the management of prostate diseases and their associated symptoms. High levels of testosterone are what causes prostate cells to grow and the organ to enlarge. Although additional research is necessary to determine its true effectiveness, the extract of saw palmetto is believed to be a highly effective anti-androgen as it contains phytoesterols, which are thought to decrease the conversion of testosterone into dihydroxytestosterone (DHT), thus lowering the levels of this hormone in the body. Several studies have proposed that saw palmetto's anti-androgenic action also reduce inflammation in the body, leading to many of its healing properties. The fatty acids found in saw palmetto can also help reduce the contraction of smooth muscle in the prostate. Another great herb for regulating testosterone production in men is fenugreek. Saw palmetto is likely safe for most people when orally. However, there is the potential for mild side effects, including dizziness, headache, nausea, vomiting, constipation, and diarrhea. For individuals who are about to undergo surgery, taking saw palmetto is not recommended, since it can slow blood clotting. On the other hand, women who are pregnant or breastfeeding should consult a physician before taking saw palmetto, since it can inhibit the production of much-needed hormones during these periods. While fruit does grow from saw palmetto, its taste is rather unpleasant and it is seldom used in any culinary capacity. The most effective way of obtaining the health benefits from saw palmetto is in medicinal and supplemental forms, where the properties are more concentrated. Liquid extract. This is a potent medicinal form of saw palmetto, inhibiting the production of androgens, which helps regulate hormones, especially in men. Tincture. Saw palmetto tinctures are a product of alcohol maceration and can reduce inflammation in enlarged prostates, as well as treating urinary tract infections. Capsules. In its most common medicinal form, saw palmetto capsules are also the most potent for regulating hormones, as well for treating hair loss and improving bladder function. Because of its unpleasant taste, there is little demand for fresh saw palmetto fruit, and it is therefore relatively hard to find outside of Florida and limited zones of the southeastern United States. In those areas, they can sometimes be found at farmers' markets. Herbal remedies and supplements of saw palmetto can be purchased from online retailers, or in specialized health stores. As their popularity continues to grow, more herbal stores and pharmacies are carrying saw palmetto products in different brands, and concentrations. AS THE SECOND MOST POPULAR HERBAL SUPPLEMENT IN THE U.S., SAW PALMETTO CAPSULES, EXTRACTS, AND EVEN TABLETS CAN BE FOUND AT MOST HEALTH STORES. It can take 3 - 6 years before seedlings become fully established plants. Saturated soils that occur throughout the summer rainy season can stunt early growth of this plant. It is an extremely slow-growing tree, but it has an incredibly long lifespan. Some plants have been reported living up to 500 - 700 years. Three to seven leaves are produced every year and can remain on the tree for two years before harvesting. A truly unique plant, native to North America, specifically Florida, saw palmetto grows in shrub or tree formations. The shrub varieties grow in a horizontal formation, with many branches growing on their stems. As a tree, the crown projects above many tangled branches. Stems run parallel with the soil and can gradually bury to form rhizomes. Flowers are white and borne on stalked panicles growing from leaf axils. Fruit is a yellowish green in the unripe state, gradually turning blue-black as it ripens. Fruit that grows from saw palmetto is fleshy and ellipsoid in shape. Saw palmetto, or Serenoa repens, is the most common palm grown in the United States. It is also the sole species currently classified in the Serenoa genus. It can grow as a shrub, attaining a height of 2 - 7 feet (0.6 - 2.1 m), or as a small tree that grows to 20 - 25 feet (6 - 7.5 m). The stems that sprout from saw palmetto's rhizomes can measure 10 - 15 feet (3 - 4-6 m) in length. Two vegetative forms of saw palmetto are recognized. The common type is yellow-green in color, while the less common type is a blue-green color sometimes referred to as the silver form. As the only member of its genus, saw palmetto is unique, and no true variations or subspecies have been identified. This may be due to the long life of each individual organism, which can grow for 500 - 700 years under the right conditions. It has been observed, however, that leaves become lighter - more silver-white than green - in sandy, coastal regions. Saw palmetto has been used medicinally for hundreds of years, first by the Seminole Tribe of Florida for treating urinary symptoms associated with enlarged prostate glands. The first documented uses of saw palmetto can be traced back to the 17th century, when English settlers reportedly used it for medicinal purposes, such as treating hair loss and bladder disorders. However, these practices were not so popular because European palates allegedly abhorred the taste of the fruit. The awareness about saw palmetto health benefits increased over time, and herbal remedies based on the fruit were first manufactured in 1907. The herb has only suffered a slight dip in popularity around 1946, due to patent complications, when a European market for saw palmetto's extract appeared around the same time. Saw palmetto was used to make soda at the beginning of the 20th century. The largest producer and exporter of saw palmetto is the United States, mainly the state of Florida, where about 5,000 tons of saw palmetto berries are harvested per year. Though still largely unknown in Eastern countries, saw palmetto forms a huge part of the herbal supplement industry and remains in high demand, particularly in the United States and Germany. In 2010, extract from its fruit was the second highest-selling supplement in the U.S., generating just under $19 million and showing signs of steady growth. Gardening. Saw palmetto is also a common ornamental plant, especially in its native growing region. It is used in both large-scale landscaping and residential areas, though the former is more common due to its tendency to cluster and attract pests. Habitat development. The tree's fruit and leaves also provide food for insect larvae. Construction. Leaves were traditionally used as thatching for shelter roofs.